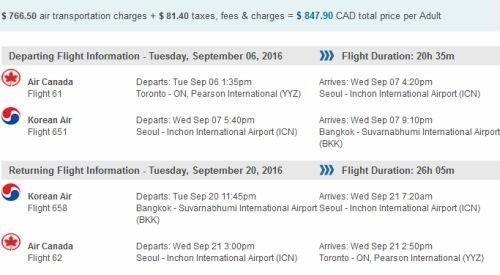 There are some very nice flight prices showing up from Toronto to Bangkok, Thailand using a combination of Air Canada, Korean Air, and ANA. Focus on the dates closer to the end of October. Sep/Oct can still be rainy, but it starts to get dry again towards the end of October. October 19 to November 02 seems to be the date combination closest to the end of October that works. October 26 to November 09 is $40 more. 1. Go to the following Google Flights search and look for dates that are priced at $898 CAD. 2. Go to Momondo.ca and try the same dates. 3. Momondo should show prices around $848 CAD, bookable through Flight Network. Note: These are also showing up on ITravel2000 for $859 CAD. Try this direct search link, and click on 'Edit Your Search' in the top right corner to try different dates. Note: The flights have a stop in Seoul, South Korea on the way there, and in Tokyo, Japan on the way back. On some dates, the stop in Seoul may require an overnight stay. Where to stay in Thailand ? The following AirBNB links will lead you to some great deals on places to stay in Thailand for under $59 CAD/night for 2 people. toronto, yyz, flight deals, air canada, bangkok, thailand, asia, southeast asia, korean air, bkk, ana and all nippon airways. 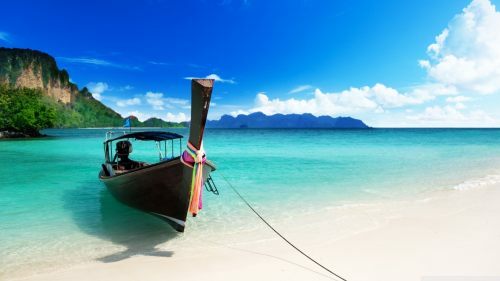 3 Responses to "Toronto to Bangkok, Thailand - $833 CAD roundtrip including taxes"
Tried all the dates suggested on momondo and flightnetwork but unfortunately the lowest price was around 938$. Is this deal expired? I would think it likely has. It's been nearly 3 weeks since it became available. you snooze, you lose i guess!